Even before his flight training at Hovercraft Training Centers, Sgt. Rick Holtgrave of the Branch County Sheriff’s Department in Coldwater, Michigan knew that there are no reliable alternatives to hovercraft as the best rescue vehicle for his team’s dangerous missions on icy Lake Michigan: "We're just screwed if we have to go out on a bad ice,” he said, “There is no other equipment. Otherwise, we'd just be pushing boats and ropes and hoping for the best." Sgt. Rick Holtgrave pilots the Department's Neoteric hovercraft. He and Branch County Sheriff John Pollack agree that their hovercraft is an invaluable tool for ice rescues. Winter is fast approaching and with the cold temperatures come ice and winter sports. Among the more popular winter sports are ice fishing, ice skating and sledding. Those who have grown up on one of the many lakes in Michiana know how much fun all these winter activities can be. With vast hills along the lakeshores, many kids enjoy sledding down them to the iced-over lake below whiles others prefer to show off their skills with a figure 8 or race their friends on ice skates. Then there is the most popular winter activity among Michiganders – ice fishing. It is considered by many to be a very relaxing way to spend the day. Simply walking on the ice can be a unique experience, especially when the snow obscures the view of what lies beneath. Like any activities, safety should be the top priority when on the ice. - Tell someone where you are going and when you expect to return. - Always test the ice with a spud. - Take the appropriate emergency items, such as a lifejacket and ice picks. - Take a cell phone in case you need to call for help. - Dress in your warmest winter clothes. - Fill a Thermos with hot coffee, chocolate or tea. Although lake goers may think the danger of drowning is more prevalent during the summer months, drowning is the seventh leading cause of accidental death in the United States, even in the winter. For this reason, Sgt. 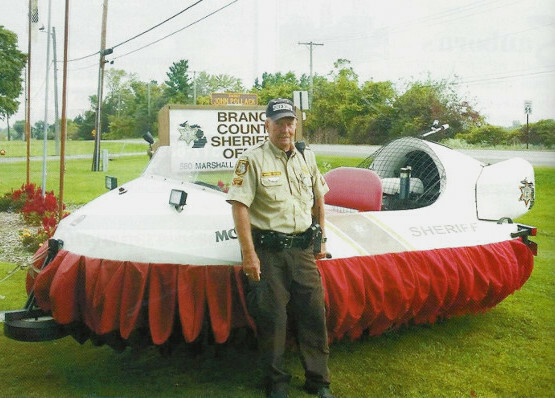 Rick Holtgrave of the Branch County Marine Control purchased a hovercraft to assist the Branch County Sheriff’s Department eight-member dive team in rescue missions. Holtgrave and Branch County Sheriff John Pollack agree that the hovercraft is a vital tool when dealing with iced-over lakes and ice activities in the winter. The hovercraft has the capability of skimming over thin ice, water, mud and grass. By using this tool, rescuers will be able to save the lives of those who may fall through the ice while preserving the safety of the rescue teams. With the ability to hold at least 900 pounds, the hovercraft works by pushing air from the engine out of the back of the craft. In return, that air fills each one of the skirts along the base. Maintaining the RPMs and utilizing the reverse thrust keeps the craft operating properly. The hovercraft is capable of going 60 mph forward and 26 mph backward. Its capability is also critical in residential areas that may become flooded because underwater obstacles such as fences, fallen trees, submerged walls and vehicles cannot affect the craft. Pollack said in the near future they hope to be able to share the hovercraft with surrounding counties.